Kurt Busch brought a setup for the short run to a marathon in the Folds of Honor QuikTrip 500 at Atlanta Motor Speedway on Sunday, the second race on the 2016 NASCAR Sprint Cup Series schedule. The 325 lap (500.5 mile) race featured three cautions, including a green flag stretch for 210 laps — which proved to be the Achilles heel for the polesitter Busch’s No. 41 Monster Energy/Jimmy John’s Chevrolet. Despite not having the long run speed needed to contend for a win, the 37-year-old, Las Vegas native still finished in the fourth position, his second top ten result this season (he ran 10th in the 58th Annual Daytona 500, the opening race on the Sprint Cup schedule). With Atlanta also being so tough on tires — due to the track’s rough surface — and his setup being geared for short run speed, the Goodyear tires on Busch’s machine wore quickly. While the lack of long run speed diminished his chances to challenge teammate Kevin Harvick and race winner Jimmie Johnson, his weakness also propelled him forward in the closing stages, however. After Richard Childress Racing’s Ryan Newman spun around on the frontstretch, the race came down to a green-white checkered finish, also known as overtime. 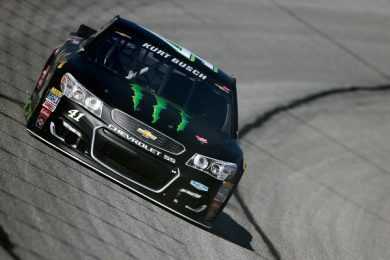 With it being a short two lap shootout — something his car was the fastest at — and the lead lap cars taking fresh tires, it gave Busch one final chance at salvaging a top five. Busch restarted eighth, advancing up to his finishing position of fourth when the caution flew for a multi-car wreck deep in the field; the crash ended the race, per NASCAR’s overtime rules. “It exemplified itself because we were great on short run speeds on that green-white-checkered. We gained from eighth to fourth. So, a long day, but I’m really happy with the Monster Energy/Haas Automation Chevy the effort, the guys, everybody,” Busch explained. Unofficially, Busch now sits seventh in the championship standings (nine markers behind the points leader) and moves to his hometown track next weekend at Las Vegas Motor Speedway. In 14 starts in Sin City, the 2004 Sprint Cup champion Busch has scored one top-five and three top ten finishes, but a triumph has eluded him. Additionally, this will be his first race at Las Vegas since 2014 — he was suspended for the first three events last season after being embroiled in a legal battle with ex-girlfriend Patricia Driscoll due to domestic assault allegations. The Kobalt 400 at Las Vegas Motor Speedway is scheduled for 3:00 p.m. Eastern, with live coverage on FOX, the Performance Racing Network (PRN), and SiriusXM NASCAR Radio, channel 90.